Take the left turn towards the town centre. After about half a mile turn left at a mini-roundabout and then immediately right into St.Swithin's road. Our works are 400 metres along on the right hand side. At the large roundabout by a BP garage turn off following signs towards the town centre. Continue through the town centre without deviating. At the far end of the main shopping area are two mini roundabouts in quick succession. At the second roundabout turn right and immediately right again into St.Swithin's Road. Our works are 400 metres along on the right hand side. 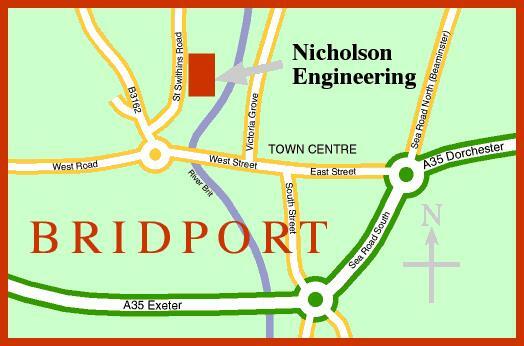 For those combining a visit to our works with a trip to Bridport we are ideally placed, being about 3 minutes level walk from the town centre. Bridport is a bustling market town, population c.6000, with a street market each Wednesday and Saturday throughout the year. Visitors to our works are most welcome during working hours by prior arrangement. As this is a working factory we are unable to allow children under the age of 14 in the works area.